Marine educators work in a variety of creative ways to teach people of all ages about marine science and ocean conservation. Work in this career is varied and may include classroom instruction, outdoor investigation, and/or aquarium/exhibit presentations. Marine educators range from professional teachers to marine biologists and may work at formal academic institutions (K-16), informal institutions (aquaria, zoos, and/or museums), eco-tourism companies, private companies, government agencies, or marine stations. 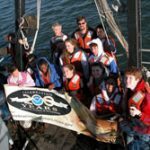 Many marine educators possess significant teaching and/or field experience interacting with people of all ages, and have gained valuable skills via internships and/or volunteer positions. Internships and volunteer opportunities are important for experience as well as for making contacts that could later help in the development of one’s career. The scientific community and the general public have become increasingly aware of and concerned about underwater sound. The ocean is full of both natural and anthropogenic (human-made) sources of sound. Much attention has recently been focused on anthropogenic sources of sound in the ocean and and their potentially harmful effects on marine animals. This has become a topic of increasing controversy, especially regarding marine mammals. Marine educators may thus develop programs and provide instruction on the physical science of underwater sound and its potential impacts on marine animals. There is also increasing interest in learning about sources and uses of sound. People and marine animals use sound in the sea to accomplish many tasks and marine educators may discuss these uses in their pogroms. Since light travels relatively short distances in the ocean, sound is often used by animals for basic activities such as finding food ( marine mammals and fish and invertabrates), locating a mate, navigating, and communicating ( marine mammals, fish and invertebrates). Sounds in the Sea > What are common underwater sounds? Sounds in the Sea > How do people and animals use sound under the sea?